Phyton (Austria), Vol. 29, Fasc. 1, pages 93 -103, 1989. 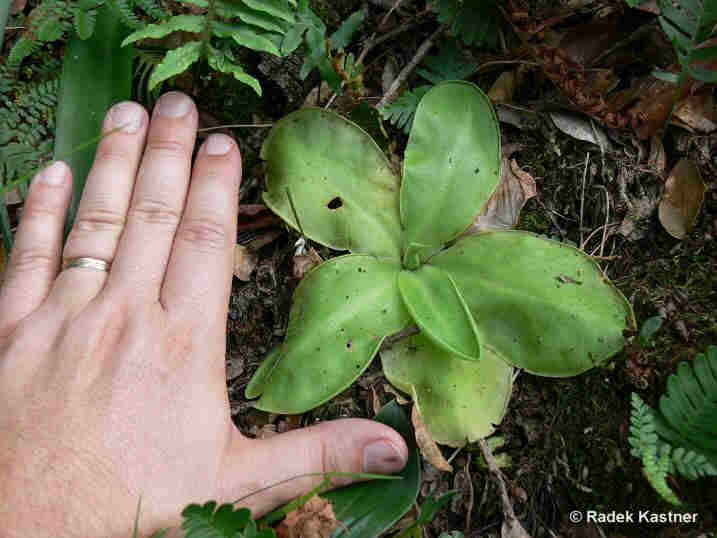 "Drei neue Pinguicula-arten der sektion Orcheosanthus DC. 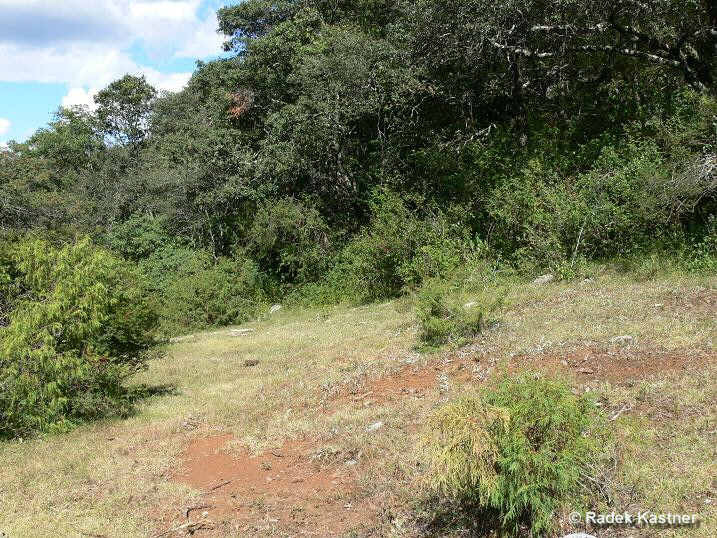 aus Mexico"
Plantae perennes. Rhizoma simplex brevis radicibus adventitiis numerosis filiformibus. Folia rosulae compactae hiemalis 30 - 40 obovata, 2 cm longa, 6 - 9 mm lata; dense glanduloso-pilosa. Folia rosulae laxae aestivalis 15 - 20; late spathulata, brevipetiolata, 8.5 cm longa, usque ad 4 cm lata, apice margo convoluta. 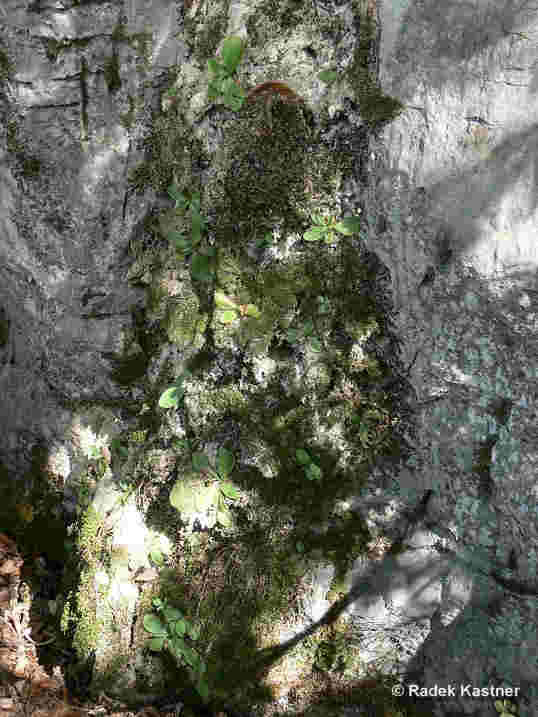 Hibernacula nulla. Florescentia II - XII. Pedicelli 4 - 5, teretes, erecti, 26 cm longi, glanduloso-pilosi. Calyx dense glanduloso-pilosus, sepala 4.5 mm longa, 2.2 mm lata, inferiora 1.5 mm concrescentia. Corolla bilabiata, intus subviolacea. Labium superius et labium inferius angulum 120° formans. Lobi 14 mm longi, 8 - 10 mm lati, cuneati, lobus medius usque ad 13 mm latus. Pili fauce simplices. Calcar ca. 3 cm longum, paucicurvatum, pilosum. Ovarium globosum, dense glandulosopilosum, stigma carnea ciliata incumbente. Ovula numerosa. Filamenta alba, thecae et pollen palide brunescentes. 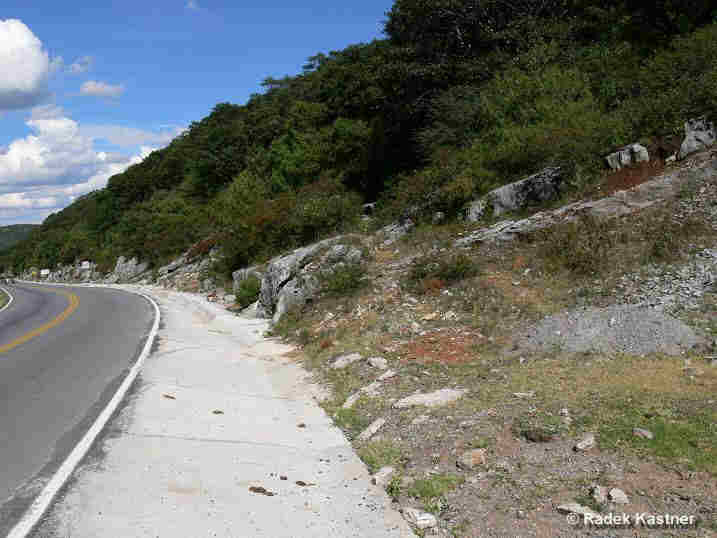 From Mexico, state of San Luis Potosi, at 48 km East of the town of San Luis Potosi, in the direction of Rio Verde. Click on the graph to enlarge and see graph of normal precipitation and normal average temperatures. The values are 30-year averages for the period 1961 to 1990. The weather stations are grouped by region (see map of weather stations). 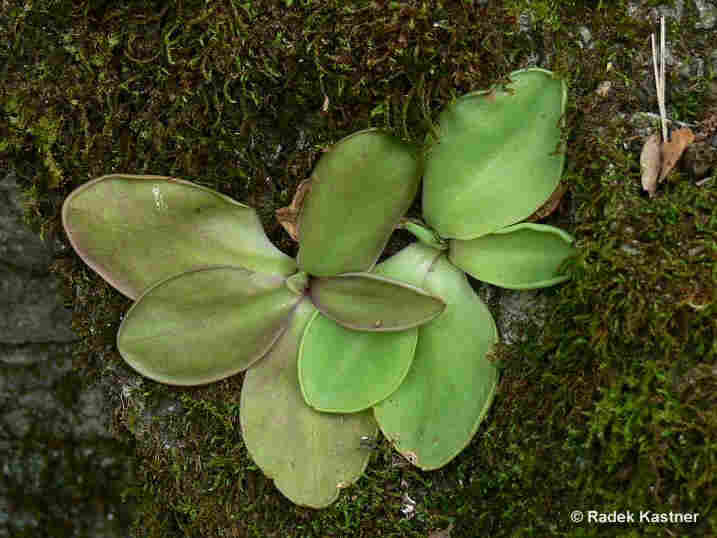 Life cycle : The life cycle observed in culture for this Pinguicula consists of two seasons, one wet and the other dry (see link). 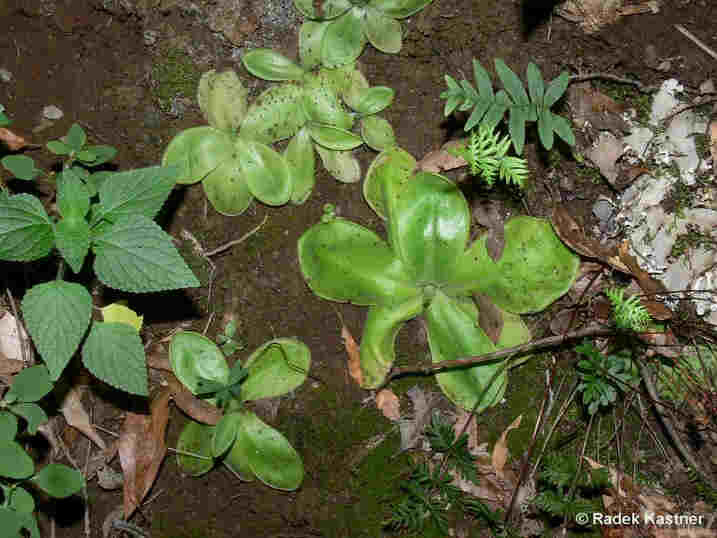 The plant forms different leaf rosettes according to the season. 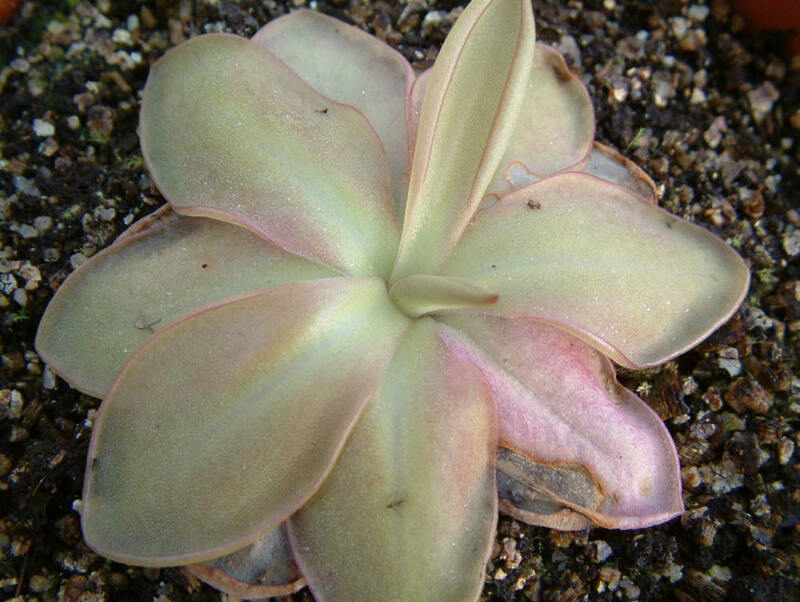 During the resting months (winter) the small succulent rosette is composed of numerous non-carnivorous leaves. 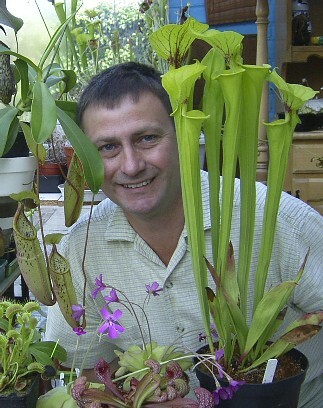 The carnivorous leaves are produced in spring and during all summer. 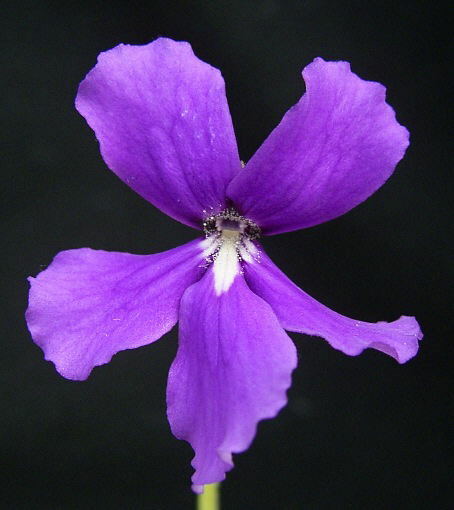 The flowering occurs from summer rosette. The life cycle of the plant is probably similar in it's native habitat but I have no data. Pot : plastic, colour terracotta, diameter 20cm, height 12cm for forming a colony. 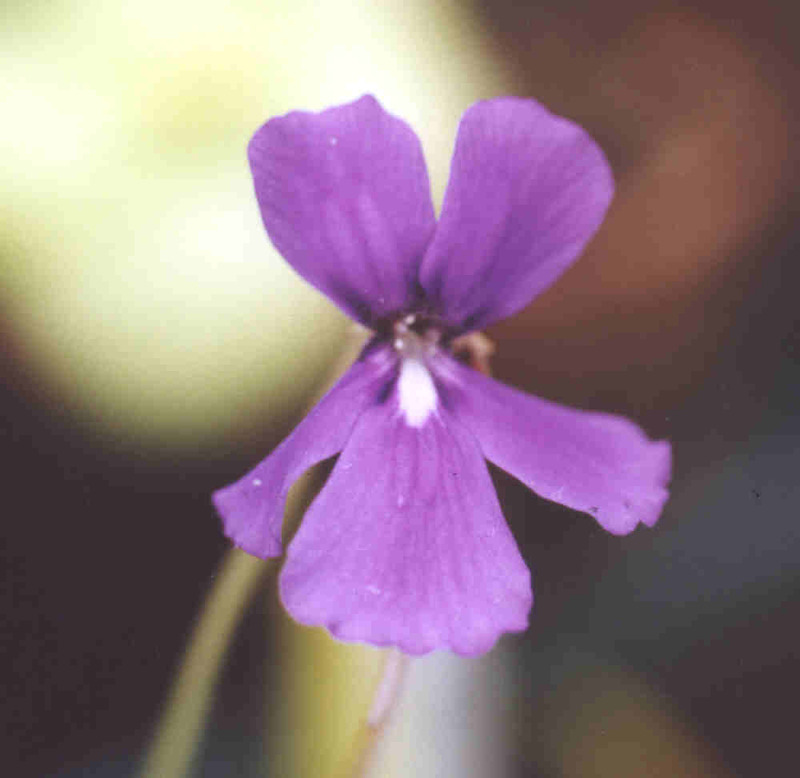 Multiplication : I have never succeeded in pollinating the flowers of this Pinguicula (needs two different clones ?) . So I don't know the seeds. 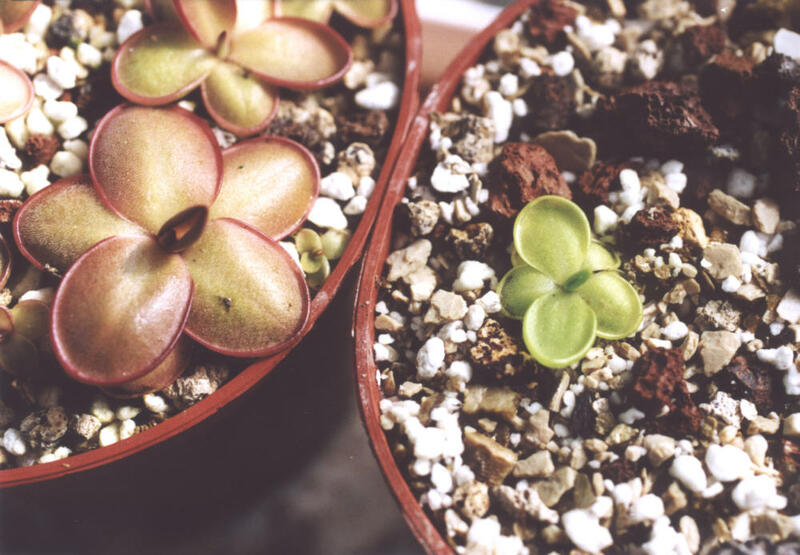 The plants can be propagated easily using non-carnivorous leaves separated from the rosette at the end of winter. You only have to carefully tear out the totality of the leaf including the white base as the plantlets will sprout from this area. Road close to the habitat of Pinguicula potosiensis. The habitat of Pinguicula potosiensis : a deciduous forest. Pinguicula potosiensis can be found on small rock outcrops in the forest (in moss or in soil with organic parts). 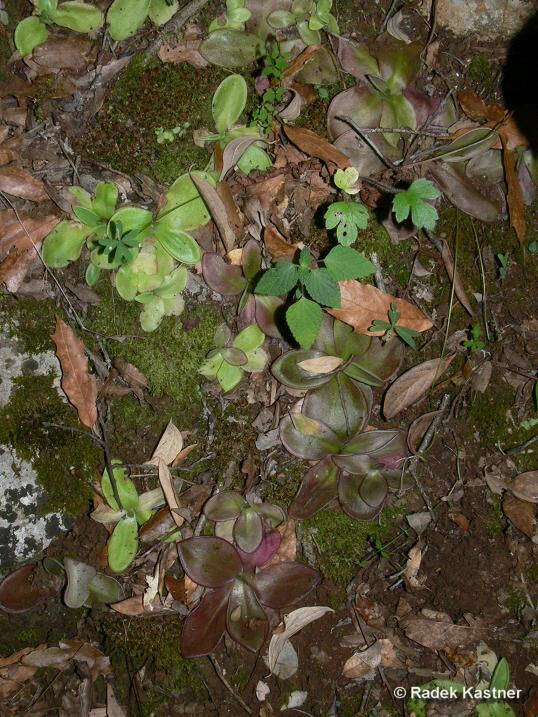 Large Pinguicula potosiensis plants with green to purple leaves. Plants are growing in almost shade. 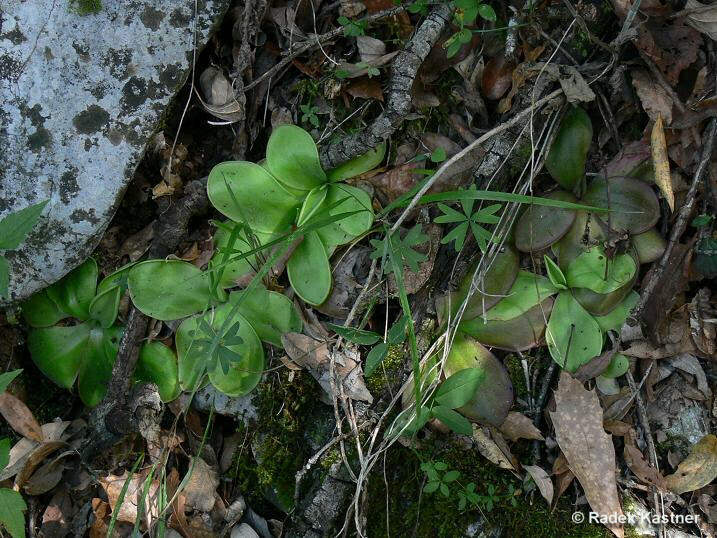 Pinguicula potosiensis growing on mosses. Pinguicula potosiensis growing on organic soil. Pinguicula potosiensis exhibiting a showy complete palette of leaves colours : from bright green to really purple leaves with intermediates plantes with also red veination. You can find more pictures in habitat of this species in the following postcard : Postcard N°3 and many more species in the articles area. 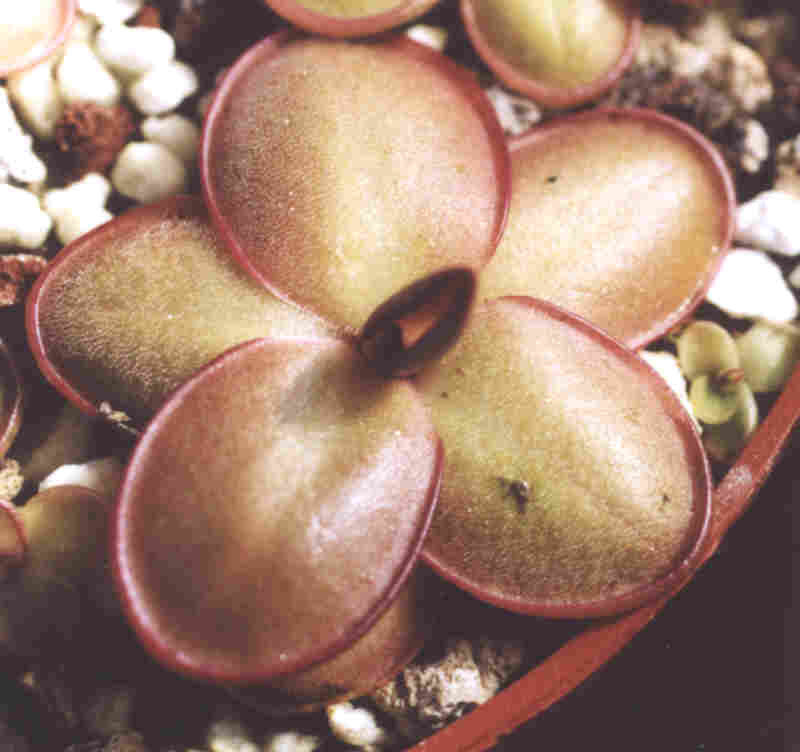 Summer rosette of Pinguicula potosiensis in culture, green and red form. The two forms are growing closely from each other and receive the same amount of sun. 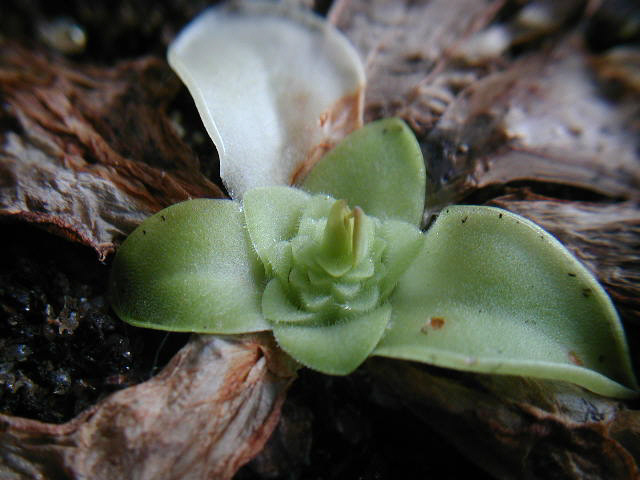 First summer leaves in the centre of the winter rosette of Pinguicula potosiensis.